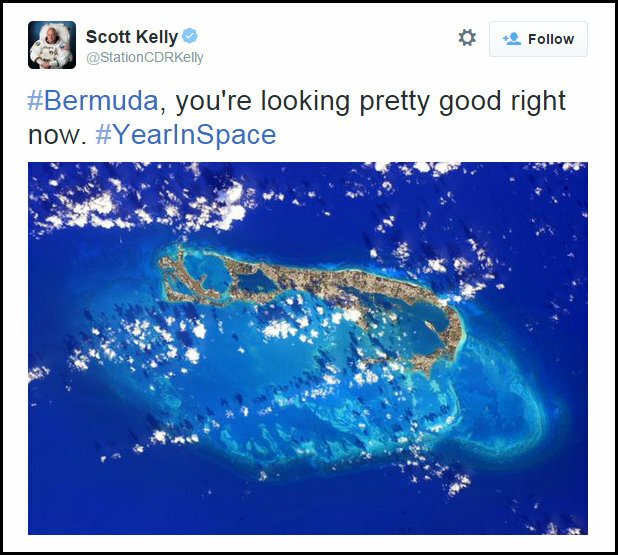 Astronaut Scott Kelly — who is spending one year at the International Space Station — tweeted a photo of Bermuda today [July 3] saying we are “looking pretty good right now”, with the photo attracting over 1500 “favourites” and “retweets” in the first hour alone. According to NASA, “Kelly and cosmonaut Mikhail Kornienko have been selected to serve a one-year mission aboard the International Space Station in 2015. Mr Kelly isn’t the first astronaut to showcase Bermuda from space, with Canadian astronaut Chris Hadfield tweeting two photos of Bermuda in 2013. Nice pic, had to turn upside down to get the essence. Dang it! I think I blinked in that photo..
there I am doing my roof! Goggle …”..Bermuda sitting atop the volcano” then you will see what we really look like beneath the surface of the ocean.Its actually scary to imagine. We r soooo very blessed to live here i in this paradise on Earth. If we had known that he was taking pictures, we coulda all said cheese. That’s played out, we are experiencing everything that the other world is experiencing. Just goes to show, you never know who’s watching you!!!! Really shows how urbanised Bermuda has become. We are almost smothered in concrete. “Paved paradise & put up a parking lot.” comes to mind. We havwe not found a way to destroy the reefs surrounding us yet. So you would admit that we will be over populated. Wow! That is majestic! I would like that in a picture frame on my wall.